Monoprints are a classic printmaking technique where a matrix is used to create an image on a smooth surface that then allows each print to contain slight differences. The matrix is like a plate that gets transferred onto the substrate. It can be a silk screen or an inkjet transfer. I often use stone paper because it has a gesso-like surface, and works with almost any art media. Other printmaking papers I use are watercolor and etching papers. Although monoprints are most commonly printed on paper I sometimes create an edition on other substrates such as glass, metal, or wood. Monoprints are made in an edition, since the source image is the same but each print in the edition is slightly different. Each print differs a bit from another and are hand printed one at a time which takes several days to complete. I print a limited edition of 5-15 prints of an image usually centered on 20"x30" (51cm x 76cm) archival paper although smaller prints are occasionally made. The size of the actual image ranges from 8" x 10" (20cm x 25cm) to 11" x 16" (28cm x 41cm). 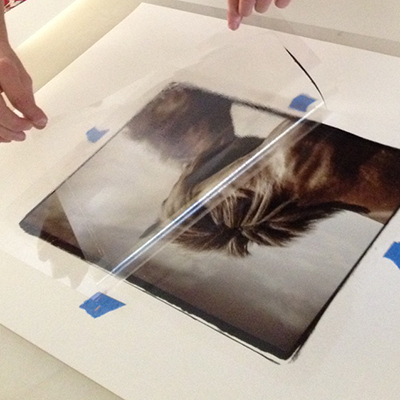 Each print is numbered and is accompanied by a certificate to verify the limited edition. Due to the time consuming nature of this process I only have a few monoprints available and once an edition is sold they will not get reprinted.